All Global Dialogue Issues are acceptable to Global Dialogue 2013 and are listed here. The issues section describes the list of all issues in more details. Issues found in Reports, Newsletters, Press Releases and Letters are also included and can be found from the following tables. Issues found in Reports, Newsletters, Press Releases and Letters are also included and can be found from the following tables. 705 Increase energy efficiencies of desalination. 707 Introduce treated wastewater, storm water or rainfall into the aquifer by the use of wells or by altering conditions to increase natural infiltration. 708 Prepare all coastal settlements around the world for a substantial increase in ocean water level. 709 Use sustainable "clean" energy technologies and "clean" management technologies to reduce energy waste. 710 Reduce the environmental impact of fossil fuel consumption. 711 Energy policy must encourage consumption to decrease and reduce demand. 713 Give women the choice of not having children and make that choice socially acceptable. 714 Apply the Global Community global strategy concerning overpopulation. 715 Apply the Global Community policies to decrease world population. 716 Enforce the Global Community moratorium on world population, the fertility rate and immigration applications. 717 Condemn the three faces of warfare we see in the world today: 1) military, 2) economic, and 3) population. 718 Implement the Scale of Global Rights in society so as to give Peoples a sense of direction now and for future planning and managing Earth. 720 Demonstrate the concept of "a Global Community" to children and youths. 721 Walk outdoors with children and youths to a location with as many natural elements as possible - park, river, lake, mountain. 722 Make children and youths discover for themselves why each member of "a Global Community" is important - each bird, each tree, each little animal, each insect, plant and human being, ~ and how all work together to create a good place to live. 723 Teach children and youths the Glass-bubble concept of a Global Community. The concept of the Glass Bubble can be extended to include the planet Earth and all the "global communities" contained therein. That is "the Global Community". 724 Teach children and youths that they have the right to make choices and how this right is part of their Personal Sustainable Development. This self-improvement journey will sustain him for as long as he uses it, the results to be enjoyed for ever. 725 The need to change the "who cares?" attitude in children. Everyone who wants a life has to take responsibility for it. 726 Let children and youths know that each and everyone of us is part of "a Global Community" wherever we go throughout our life. Personal sustainable development has to do with our behavior within this global community, what we do or dont, cause and effect, and how we interact with someone else global community and, on the planetary scale, with the Global Community. We are constantly required to re-evaluate our values and make decisions. Make them to understand that it is OK to question our ways and behaviors and start a discussion amongst us all about a universal scale of values. As an example, this may be the time to introduce the Scale of Global Rights of the Global Community. 727 The appalling dilemma of decision-making. The idea here is to teach children and youths a unique way to make decisions. We are endlessly faced with the same choice hidden in endless guises unitl we "get it right." 728 Improvement based on conscience is self-improvement which requires discipline to get rid of things that have to go and be replaced by actions that succeed. What about me needs "starving out" so good qualities can grow? 729 What is personal sustainable development? Why is this important to teach children and youths? At the end each and everyone of us decides what sort of person we want to become. After going through this personal clean-up we become a better citizen, a more sensitive neighbour, a moral responsible father, and a more useful and respected member of the Global Community. 730 What spiritual values and survival should be taugth to children and youths? Having said that what are spiritual values to sustain life? Most people are part of a religious group to use as an excuse for killing other people and destroying communities in other countries. Children and youths should be taught the secret wisdom behind all the existing religions and helping them to sift out the common truths. Let them seek the best of the best. The teaching of the Soul of all Life would certainly be the best of the best. 731 Old rules to deal with old fears. 10. Perversions: child prostitution, child selling, etc. Self-interest, self-preservation as a species, as peoples and inhabitants of this planet, instinct, are all driving forces of global human consciousness. Global consciousness is about a chain of dependence; everything depends on another form of life for survival like a symbiosis: lifeforms who contribute to the food or well-being of another species. 733 The Universal Scale of Values or Scale of Global Rights must be taught to children and youths. The Scale gives a person a sense of direction, a goal to achieve, and the hope that by achieving the goal the world will be a better place and at Peace. From this scale, agreed upon by all members of the Global Community, the assessment of sustainable development can be conducted. The benchmark is the scale established in year 2000 along with the first evaluation of sustainable development conducted with respect to the above mentioned four levels. 734 Explain the main goal of Global Community. In other words, everyone who wants a life has to take responsibility for it. 735 Conduct exercises to learn about specific species and create projects. Imagine what their own Glass Bubbles might be like. 736 Make children and youths build their own self-improvement way. 737 Actions geared to survive a million years as a species. 738 Regulate world population by means that are voluntary and benign. 739 Take along with us a large proportion of other lifeforms. 740 Recognize that men and women have equal rights. 741 Build global communities for peace with the understanding of global problems this generation is facing: conflicts and wars, no tolerance and compassion for one another, world overpopulation, unemployment, insufficient protection and prevention for global health, scarcity of resources and drinking water, poverty, Fauna and Flora species disappearing at a fast rate, global warming and global climate change, global pollution, permanent lost of the Earth's genetic heritage, and the destruction of the global life-support systems and the eco-systems of the planet. We need to build global communities that will manage themselves with the understanding of those problems. All aspects are interrelated: global peace, global sustainability, global rights and the environment. The jobless is more concerned with ending starvation, finding a proper shelter and employment, and helping their children to survive. Environmental issues become meaningless to the jobless. In reality, all concerns are interrelated because the ecology of the planet has no boundaries. Obviously, as soon as our environment is destroyed or polluted beyond repair, human suffering is next. 742 Teach Peace in local communities by finding their problems and concerns, and making a difference for the better. 743 Find statements from all religions, all faiths, that promote ethical and moral responsibility to life and a responsible Earth management. This was assumed to work well within the context of the global civilization of the 3rd Millennium and after defining the Global Community criteria of symbiotical relationships . In this context, we have defined that any symbiotical relationship is for the good of all. It is based on a genuine group concern and unconditional support for the individual's well-being ~ a giant leap in human behaviour. Symbiotical relationships are needed today for the long term future of humanity, for the protection of life on our planet, and to bring about the event of peace amongst us all. 744 Give every global citizen essential services. 745 Educate the coming generation with good principles. 746 Introduce and teach Soul of all Life teaching about Peace. 747 Use the Global Community methods of teaching to children and youths. Throughout Global Dialogue 2013, i.e. from September 1st, 2011, to August 31st, 2013, Global Peace Village will present several methods of teaching to children and youths as they are more likely to absorb and retain the internal structures needed to bring about Peace to future generations. These methods of teaching have already been laid down by the Global Community during the 1990s. We are showing some of the papers with their links just below here. They were copied in http://globalcommunitywebnet.com/PeaceNow/Old1999Papers.html for fast reading. 748 Use the Global Community animations to teach Peace to children and youths. 700 What immigration does is to infringe into the most important rights on the Scale of Global Rights: Sections 1, 2, and 3. It amounts at creating the world overpopulation problem which is way far more destructive than conducting military warfare. The Global Community condemns all types of warfare we see in the world today: military, economic and population. Surely the rights to protect the existence of all life on our planet are more important than cultural and religious rights. 701 Earth management includes problems with immigration in the world. We have shown that all aspects are inter-related and affect one another. Population warfare amounts to increasing demands for more resources but nations are already fighting for what is left of natural resources on the planet. Today, we need five healthy Earths to feed the world population. And population warfare also amounts to a specific cultural or religious group of a population trying to gain control of a nation by increasing its size and affecting the political outcomes of government in power. All about control! 641 Chapter I: Global Parliament represents, its "Beliefs, Values, Principles and Aspirations"
565 Earquakes, cyclones and other natural disasters require a rapid and efficient response from the world to help those in needs. 587 As a first step to getting help, all nations can and should approve those first three sections on the Scale. The approval would supersede the nation political and physical borders of participating member nations. The Global Protection Agency (GPA) would have the approval from all member nations to give immediate help, bypassing normal government protocols. Somewhat like an emergency unit but at the global level. That is what those first three sections mean. They represent an efficient and immediate emergency response to help. 589 We need all nations to be a part of this Global Movement to Help. 591 Human made global destruction and disasters require a rapid and efficient response from the world to help those in needs. 598 Preventive actions against destruction of the global environment, conflicts, pollution, genocides, invasion of nations, violation of global rights, and Global Law. 600 The Global Protection Agency (GPA) would have the approval from all member nations to give immediate help, bypassing normal government protocols. 603 The GPA is a global organization much like the World Trade Organization (WTO) for trade between nations, the World Health Organization (WHO) for health, or the European Union, North American Free Trade Agreement (NAFT), South American Community of Nations (SACON) for trade and economics. 604 The Global Protection Agency (GPA) will train and lead a global force, bypassing traditional peacekeeping and military bodies such as the United Nations and NATO. The GPA will enforce the law. And that is a long term solution to the planetary state of emergency we offer the Global Community. And that is also how we can stop the global warming of the planet and protect the global life-support systems, thus largely improving the quality of life of the next generations. 606 The Scale of Global Rights was designed to help all life on Earth. 607 The Global Community offers a more meaningful union in the form of nine or more Global Governments. 608 The Federation of Global Governments is the place of meeting between Global Governments. The very first step of the Federation, and maybe the only one for several decades ahead of us, would be the approval of essential services amongst the participating member nations. 612 The Federation of Global Governments is now applying more emphasis on the urgent need from the people of all nations to give everyone essential services. 457 Who owns the Earth? 459 To extend democratic principles down to the ownership and control of the earth. 460 Our present land ownership affects our community, our politics, our environment, and quality of life. 461 Global Economic Model proposed by the Global Community has a primary goal the protection of all life on this planet. 462 "A global community" is not about a piece of land you acquired by force or otherwise. One could think of a typical community that does not have to be bounded by a geographical or political border. It can be people living in many different locations all over the world. The Global Community is thus more fluid and dynamic. We need to let go the archaic ways of seeing a community as the street where we live and contained by a border. 463 A typical community may be what a group of people, together, wants it to be. It can be a group of people sharing with the same values. It can be a group of people with the same cultural background, or the same religious background. Or they can be people with totally different backgrounds and beliefs. The people making a global community may be living in many different locations on the planet. With today's communications it is easy to group people in this fashion. It can be a village, or two villages together where people have decided to unite as one community. The two villages may be found in different parts of the world. It can be a town, a city, or a nation. It can be two or more nations together. 464 Following this thinking we see land ownership is no longer a problem. The Earth and all its natural resources belong to all the "global communities" contained therein. A village, or a city is "a global community" and owns the land around its boundaries. Along with the Global Community, it has ownership of all natural resources within its boundaries. We will see in the Preview how this new system can work. 465 As mentioned above, land here, by definition, covers all naturally occurring resources like surface land, the air, minerals deposits (gold, oil and gas etc), water, electromagnetic spectrum, the trees, fish in the seas and rivers. It is unjust to treat land as private property. 466 The Global Economic Model proposes to collect for the people a payment for the use of natural resources and to remove taxes on labor. 467 A condition of "ownership" of any particular landsite or natural resource is payment for the use of natural resources back to the community as a whole. Payment for the use of natural resources is a source of public finance for the needs of the community. 468 The community "allows" individual private use of sites on the condition that its fair rental value is paid to the community. If a particular land site is mismanaged then the community must charge a higher rate to pay for damages and cost of restoration. 469 On the global level the Law of the Seas Covenant is an example of payment for the use of natural resources Ocean resources are the common heritage of all and a proper source of funding for global institutions. Water belongs to the earth and all species and is sacred to life therefore, the world’s water must be conserved, reclaimed and protected for all future generations and its natural patterns respected. 470 Water is a fundamental human right and a public trust to be guarded by all levels of government; therefore, it should not be commodified, privatized or traded for commercial purposes. These rights must be enshrined at all levels of government. In particular, an international treaty must ensure these principles are noncontrovertable. 471 All the Earth natural resources belong to the Global Community to be used, developed and protected for the maximum benefit of the people and of all life. 472 The Global Economic Model allows for the establishment of micro credit facilities for farmers and women to promote their access to forms of land tenure that facilitate ownership of land. 473 The goal of the Global Economic Model policy is to create a model of public finance which offers incentives for correct distribution of wealth amongst every global citizen. 474 The model makes a clear distinction between private property and common property. Private property is that which is created by labor. Common property is that which is provided by nature. The Global Economic Model policy removes taxes from wages and other private property and increases taxes and user fees on common property. 475 Only the Global Community can rightfully claim ownership of the Earth. 476 The theme of this Global Dialogue being "The planet-Life-Soul of Humanity symbiotical relationship", we will see how the relationship can help this generation of young people and the next ones to remain healthy. 477 The young people of to-day are interested in all the secret wisdom behind all the existing religions and sifting out the common truths. They seek the best of the best. They are aware of the Soul of Humanity and have established a spiritual symbiotical relationship with it, and thus with God. They seek the exaltation and merging of their Souls into one to gain strength, friendship, creativity, love and light. 478 The young people today are educated to understand a broad panorama of human truths ~ all those universal needs and rights every one shares. The Scale of Human and Earth Rights has become an inner truth and the benchmark of the millennium in how they see all values. The Earth Court of Justice brings security, peace and justice for all. They no longer fear the unknown as Justice is for everyone and is everywhere, a universal constant. The Global Justice Movement for all life is now driven by these young people. 479 The United Nations (UN) cannot have characteristics of sovereignty, which has been defined around a territory and population, is not the same thing as a sovereign UN. The Global Community can. 480 The Global Community has in fact been defined around a given territory, that territory being the planet as a whole, as well as a specific population, which is the Global Community. The issue here is not that of populations and boundary lines, but of the demarcation of power and control over the earth that is the foremost formal attribute of sovereignty. 481 The task of conservation, restoration, and management of the earth is vitally linked to the question of "Who owns the Earth?" The large gap between rich and poor is the cause of conflicts and wars. 482 The impacts of our democratic institutions are devastating when so few people control most of the earth. 483 The cost of peace has too often been the cost of continued injustice and conditions of economic servitude. Only Global Parliament has adequate legislation to overcome this problem. 484 What we are seeing is the state of a new geography of conflict - a global landscape in which competition over vital resources is becoming the governing principle behind the disposition and use of military power. The result is a new strategic geography in which the control and use of natural resources rather than political boundaries are the major defining features. 485 The primary social adjustment of the Global Community is to make sure that politics is not a pathway to wealth acquisition. 486 We need to take a giant step forward to a new form of democracy. We, the Global Community, must now direct the wealth of the world towards the building of local-to-global economic democracies in order to meet the needs for food, shelter, universal healthcare, education, and employment for all. 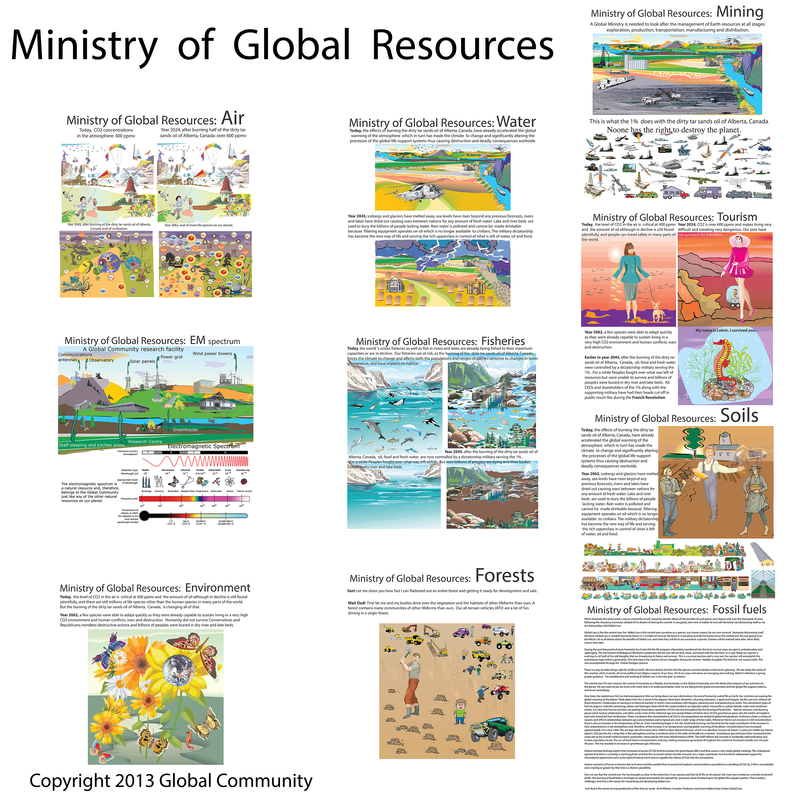 487 The Global Community has proposed a new democratic mandate recognizing that land, and all other natural resources rightly belong to the Global Community. The earth is our birthright and our common heritage. 488 This criminal maldistribution of wealth must be stopped. We need to make some fundamental changes. We need political and economic systems based upon the human right to land and other natural resources. 489 An individual, or a business should hold no more than is required for their home and sustenance. All that is not used should be held for the free use of family to make homesteads, and to hold them as long as they are so occupied. 490 When it comes to property ownership it is the value of the improvement only, and not the earth itself, that is individual property. Every proprietor owes to the community a payment for the use of natural resources. 491 The land problem is the root cause of the deterioration and mismanagement of our planet: loss of species and topsoil, polluted air and water, global warming and climate change - the list of catastrophes grows each day. 492 The concentration of property in private hands began very early in Rome and was based on the idea of absolute and exclusive individual ownership in land. Modern civilization has not yet discarded this antiquated ownership concept. In fact, this is one of the main reasons of the present global crisis in which the rich becomes richer and the poor becomes poorer. 493 Democratic governance is based on the firm foundation of equal rights to the land and resources of the earth, a democracy for all people which removes the burden of taxes from those who labor and directs government to collect the value of our common wealth for the benefit of all. 494 Democratic systems of governance have must support the right to land as a human right. 495 The unfair distribution of land ownership affects our community, our politics, our environment, and the quality of life on Earth. The Global Economic Model will have first and foremost the well-being of all the people on this planet. 496 The Global Economic Model is based on respect and value all life on earth. It recognizes that we as human beings are trustees and caretakers of all life on Earth. The Global Economic Model extends the democratic mandate to solve the land problem by affirming the equal right of all people to the earth. 497 The Global Economic Model is global, as people are freed to move beyond borders and boundaries and claim the whole earth as their birthplace. 498 How the earth should be owned is the major economic question of this time. The world should be owned by all life. Our Bill of Rights does not proclaim the human right to the earth. 499 We must grasp the injustice at the core of our present economic system. Our use of the earth as a market commodity is the basic flaw in our economic system. 500 When land became a 'commodity' and lost its status as provider and sustainer of life, society began its history of subjugation and exploitation of the earth. 501 Astronomical sums are currently accruing as unearned income to a relatively few individuals, families and corporations who are holding large amounts of land, and other natural resources as their own exclusive private property and as unearned income. 502 One of the major functions of global governance is to grant clear titles to land and other property. We need only reflect for a moment on the fact that in Canada, for example, land was acquired by the colonizers from the native peoples under the old Roman empire land laws of "dominium" - the legalization of land acquired by conquest and plunder. 503 Democratic political rights have not given society democratic economic rights. 504 Taxes on labor and productive capital should gradually be removed, as the value of earth natural resources becomes the proper source of funding for the community. 505 A significant proportion of the profit that has poured into the global banking system in the past several decades was not a product of honest labor, but was in fact funds generated from the use of natural resources such as oil. 506 As payments for the use of natural resources are made, land speculation and poor land utilization diminsish. 507 Those with minimum wage incomes are finding it increasingly difficult to afford decent housing. 508 Intensively managed small farms and bio-intensive farming methods depending on renewable energy sources can bring both social and environmental stability. 509 Our Global Movement for payment for the use of natural resources to create revenue can provide the basis for worldwide economic democracy. 510 The solution to the problem of land speculation is payment for the use of natural resources to be used for the benefit of the whole community. 511 Land value taxation can be the sole means of public finance. Under this policy, improvements on land will not be taxed, only the land value would be taxed. In other words, the financial needs of the community would be adequately taken care of out of the economic rent of land. When people are not taxed on their wages and the returns to capital, there would be no involuntary unemployment; and incomes would be good enough for everyone, such that poverty would be a historical curiosity. 512 Payment for the use of natural resources policies shift taxes off of labor and productive capital and onto land and resources. 513 A vast amount of the funds of the International Monetary Fund and the World Bank represent a theft from the global commons. Under the common heritage principle, these funds would have been used to benefit the Global Community either by direct dividends or as interest free loans through a revolving loan fund type of system. 514 Loans made by the world financial institutions should be declared illegal. 515 A condition of "ownership" of any particular landsite or natural resource is payment for the use of natural resources back to the community as a whole. 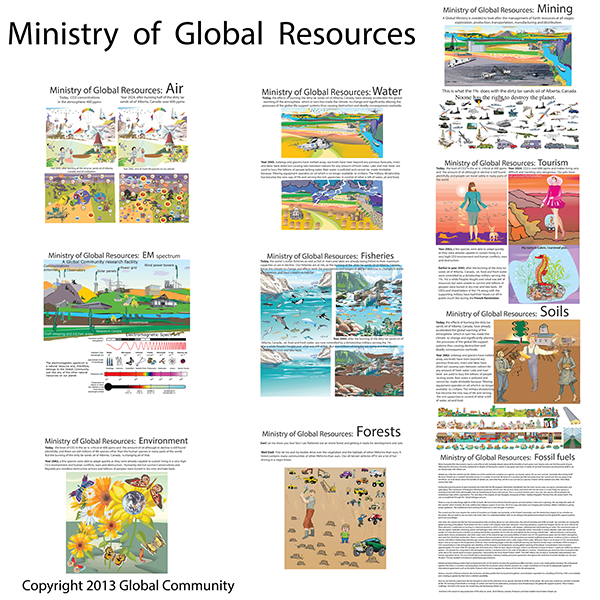 516 The rights of individuals in natural resources find their limits by the just rights of the Global Community. 517 All the Earth natural resources belong to the Global Community to be used, developed and protected for the maximum benefit of the people and of all life. 518 A very powerful few are in possession of the earth's resources virtually without taxation. 519 To speak of enforceable global law is to speak of world power. 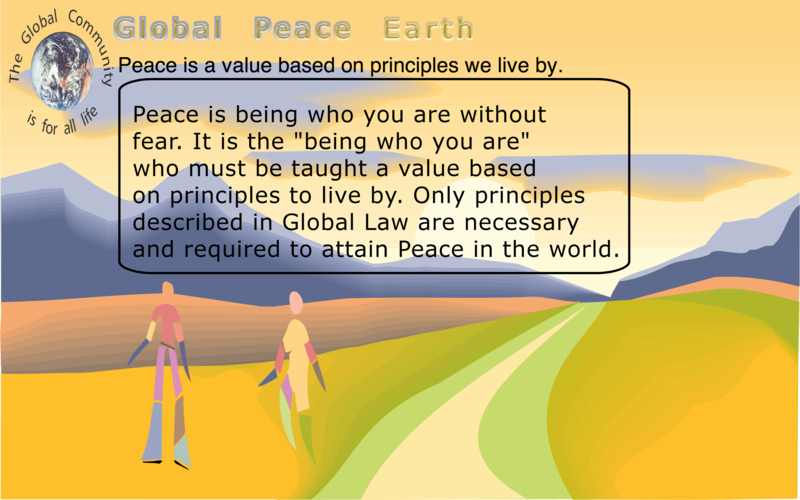 Global Parliament has the power to make the laws of the land and to make the rules for the territory of the earth. Global Law has been and continue to be researched and developed for this purpose. 520 The health of a person and the health of the Earth is interrelated. 521 Allowing anyone to own the land on which and from which other people must live, we have given a person power that increases as material progress continues on. 522 We need to take a giant step forward to a new form of democracy. We, the Global Community, must now direct the wealth of the world towards the building of local-to-global economic democracies in order to meet the needs for food, shelter, universal healthcare, education, and employment for all. 523 Global governance has not resolved an important global principle question. This question concerns property rights in land - property rights in the earth itself. The fundamental question is, "Who Should Own the Earth?" 524 When people buy up large lots of land near towns and cities without developing them they wait for such a time when the land prices would go up so it could be sold at a larger profit. The rise in land value is a socially created value and as such rightly belongs to the community. 525 Land speculation affects development when land is held out of use. Those people or businesses who need land are denied access. 526 Democratic governance has not been concerned about how the land was obtained in the first place. We need only reflect for a moment on the fact that in Canada, for example, land was acquired by the colonizers from the native peoples under the old Roman empire land laws of "dominium" - the legalization of land acquired by conquest and plunder. 527 Land tenure in the West has been originally acquired by conquest and force, and thus democratic political rights have not given us democratic economic rights. 528 We can promote peace building a democratic governance on the principle of equal rights to the land and resources of the earth. 529 Today democratic governments have never affirm the equal rights for all to the land and natural resource base that sustains all life. 530 Banks collect an ever increasing payment for the use of natural resources as private profit. As investments are made, and land speculation continues, then land values increase more rapidly than wages. And governments increase taxes on middle class wages in order to pay for social programs. 531 The Global Economic Model has a balanced and just relationship of citizenry to government. 532 The Global Economic Model is global, as people are freed to move beyond borders and boundaries and claim the whole earth as their birthplace. 533 How the earth should be owned is the major economic question of this time. The world should be owned by the people living in it. However, this absolute necessity for our very existence is nowhere guaranteed in our constitutional laws. 534 Treating the earth as simply a commodity is the root cause of the large gap between those who have too much and those who have too little. 535 When land became a 'commodity' and lost its status as provider and sustainer of life, Western civilization began its history of subjugation and exploitation of the earth based cultures. 536 The Global Economic Model seeks to eliminate subsidies that are environmentally or socially harmful such as: energy production, resource extraction, weapons of mass destruction and war industry. 537 The Global Economic Model aims to eliminate taxes on wages and earned income, and on homes. 538 The Global Economic Model also allows for an increase of taxes and fees on emissions into air; pollution of water, or soil; land sites; lands used for timber, grazing, mining; ocean and freshwater resources; electromagnetic or radio-frequency spectrum; satellite orbital zones; oil and minerals; and hydropower. 539 The products resulting from the interaction of land and labor are rightfully held as individual private property, while land and all other natural resources are recognized as the common heritage of the Global Community. 540 Once the human right to the earth is firmly established in the minds and policies of a democratic majority, land and other natural resources will no longer be taken by the few from the many either by the force of military might or by the mechanisms of the market. 541 When we apply the common heritage principle to land and all other natural resources, we see that land can be treated as 'common property'. 542 Taxes on labor and productive capital should gradually be removed, as the value of earth natural resources becomes the proper source of funding for the Global Community. 543 The main causes of the present global crisis in which the rich becomes richer and the poor becomes poorer. 544 When Christianity became the state religion of the Roman empire, the early Christian teachings on land were overtaken by the Roman land laws of "dominium" - a legalization of property in land originally obtained by conquest and plunder. 545 The increase in the value of land arising from the efforts of an entire community should belong to the community and not to the individual who holds title. 546 The planet and all its resources of land, water, the air, forests, minerals, the atmosphere, electro-magnetic frequencies, and even satellite orbits are the common heritage of all and must no longer be appropriated for the private profit of a few to the exclusion of the many. The Global Economic Model makes sure that the profits of the earth will benefit all life. 547 The incentive signals of the world's taxation systems currently promote waste, conflicts and wars, environmental damage, and the concentration of wealth. 548 A clear title to land gives the security of use rights and also permits owners to speculate and profit from land as a market commodity. When owners are unable to obtain employment to pay rent for housing, the cycle of poverty and landlessness starts all over again. 549 Holding land as investment property and a way to accumulate wealth is a primary cause of the maldistribution of wealth. 550 The commodification of land and land speculation inflates land values to the point where those who have only labor to contribute to the productive process must pay ever higher amounts for access to land for shelter. 551 Workers must borrow to pay for land. They borrow from those who already have acquired surplus wealth and have deposited their funds in banks. If the workers lose their jobs and cannot pay the mortgage, they must surrender their land to the banks. This is the land problem - the fact that so few now control so much of the land and resources of the world. 552 As the payment for the use of natural resources becomes an integral component of Earth management many good things happen. 553 The Global Economic Model has put forward a system of finance based on payment for the use of natural resources. Thus, cities and provinces would draw their funding from the payment for the use of natural resources such as surface lands; regional authorities would collect from the of oil and minerals, and of other Earth natural resources, global governing agencies such as the Global Community would be funded by a percentage from these two levels as well as that of deep sea resources, the electromagnetic spectrum, satellite orbital zones, and other global natural resources. 554 Sufficiently high user fees and pollution permits encourage business and industry to find more efficient and cost-effective controls. Pollution taxes function as pay-for-use fees for common heritage resources of land, water and air and make the tax system work for all life and the planet. 555 Property tax relief for agricultural land may increase the likelihood that it will attract those looking primarily for tax shelters and speculative investments. Such nonproductive incentives ultimately inflate land values overall, making it increasingly difficult for working farmers to access and maintain acreage for viable agricultural enterprise. 556 The high price of land means that the modern food and agriculture system provides no options for those who cannot find a paying job other than subsistence on charity or government supports. Those with minimum wage incomes are finding it more difficult to afford decent housing. 557 This Global Movement for land value taxation and payment for the use of natural resources for revenue can provide the basis for worldwide economic democracy. 558 Land is affordable when it is freed from speculation and private profiteering. 559 The Global Community Land Trust leases can secure title and tenure to the poor and landless while eliminating the problem of the commodification of land. 560 Corporate profits from real estate related activities often escape from taxation via offshore accounts and other tax shelters. 561 To extract natural resources or to use water or air would require the advanced payment of environmental security deposits. A heavy pollution tax would drastically increase incentives for clean technologies. 562 Global commons are those universal values, principles, ideas, concepts, beliefs, truths we have all in common. They may also be symbiotical relationships. Global commons are the many reasons why humanity get together in times of uncertainty and distress. Wars and conflicts, environmental disasters, earthquakes and Tsunamis, are a few examples. Other times we get together in research and development, the exploration of space, development of new technologies, education, so many reasons for us all to meet and dialogue. The list goes on a long way. Today we are getting together to find new global commons that can help for the survival of humanity and all life on Earth. And so you are asked to participate in Global Dialogue 2009. 563 Most issues and aspects of global governance and Earth management are already being applied by the Global Community. But there is no agency powerful enough to protect life on Earth from those who care not about it. At best what we have is the Global Justice Movement for all life which has found a process for the establishment of justice amongst us all. What we have not done is the actual governing and managing of the planet as per the Global Constitution and Global Law. And that is our first priority now. 329 The role of education in building Global Communities for all life. Global Dialogue 2000, the World Congress on Managing and Measuring Sustainable Development - Global Community Action 1, focussed on a Global Community Action Plan to bring together all grassroot movements and civil society to the building of Global Communities for all life on Earth. Global Dialogue 2009 will make this Global Action Plan a reality by calling upon educators a humanitarian service for the education of this generation on the goods of building Global Communities for all life. 382 * Participate in Global Dialogue 2009 to help humanity find solutions. 266 Send us your own short version of the Global Constitution. It has to be developed from the actual longer version approved by Global Parliament. 267 Send us your own short version of the proposed Global Citizens Rights, Responsibility and Accountability Act It has to be developed from the actual longer version. 308 9.31 What might be the best model of policy administration? The following issues were discussed during Global Dialogue 2004 and are included in Global Dialogue 2009, and also in future Global Dialogues. 4. The Statement of rights, responsibilities, and accountabilities of a person and of belonging to 'a global community' and to 'The Global Community', the Earth Community, the human family. Global Dialogue 2013 has already begun. Roundtable Discussions have begun on the Internet and you can participate now, today. Start by going through the process described on the front page. Workshop Sessions have also already begun. Start your own Workshop Session. Follow the process on the front page. Be a Leader. The period August 17-22 is a time for Workshop Sessions to be held at physical sites and for summarizing results, and August 31 is the closing of Global Dialogue 2014 on the Internet. If we continue to have sponsoring, Proceedings 2013 will be written and published in September/October 2013 and will be made available on the website of the Global Community afterwards. Participants may be part of a group dealing on a specific issue by email. All Leaders are required to send an Opening Statement related to their Discussion Roundtable or Workshop Session. A Closing Statement should also be sent during the period August 17-22, 2013. These statements along with the comments and recommendations will be inserted in the space reserved to each Discussion Roundtable and Workshop Session on our website.